Skate Cape May 2011: Updates! Function, Frends, Kracked Skulls, Mile High Skates, DaddiesBoardShop, Wristbands, R&J! Updates! Function, Frends, Kracked Skulls, Mile High Skates, DaddiesBoardShop, Wristbands, R&J! Sorry it's been so long without a new blog post! I've been away for quite some time and just haven't found the time to update the website as much as I want to. Over the past two weeks, we've picked up Function Drinks, Frends Headphones, Kracked Skulls Skateboards, Mile High Skates, and DaddiesBoardShop as sponsors for Skate Cape May! And, we just recently received a shipment of (you guessed it!) wristbands. The picture above was enough of a giveaway -- sorry to take away the surprise of it! 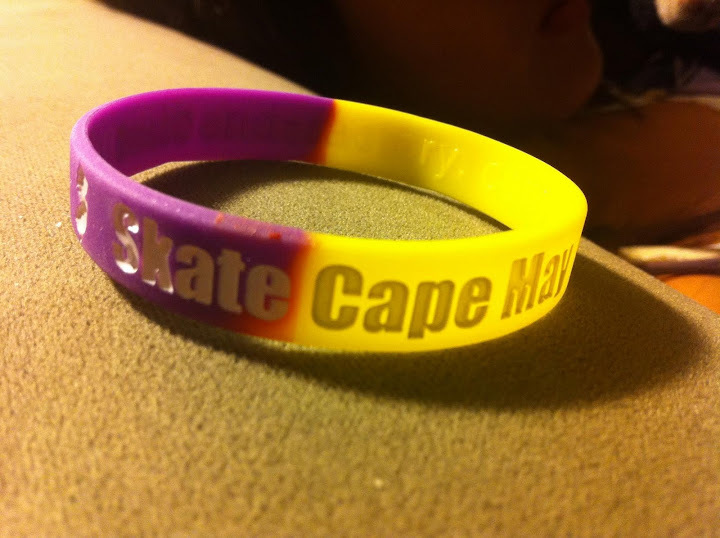 The wristbands this year are much nicer, with a yellow/purple segmentation, Skate Cape May on one side, Alex's Lemonade Stand on the other, and a white paint fill. Look out for our new wristbands at each lemonade stand location! We also picked up the R&J Publicity firm thanks to one of Danny's "connections," (heh) who will be helping us out by getting us publicity throughout NJ and elsewhere. Many thanks to them! As for T-Shirts, we are at a bit of a standstill as we haven't been able to find anyone to help us make the shirts this year so far -- if anyone is interested in being a shirt sponsor or knows if anyone would be able to offer us a discount or something, it would be greatly appreciated!